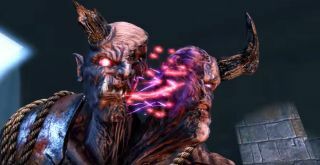 Eyedol marks eighth and final DLC character for Season 3. If you played the original Killer Instinct back in 1994, you’ll likely recall the bicephalous satyr-like end-boss demon Eyedol through gritted teeth. Its height, power, and pain-in-the-backside spiked mace proved quite the challenge, which might be why Iron Galaxy Studios and Microsoft have chosen the powerhouse as the eighth and final DLC character to enter Season 3 of the 2013 (2016 on PC) reboot. “How do you feel about second chances?” asks the trailer above. Judging by Eyedol’s behaviour there, I’m not sure we have much of a choice. Good luck come July 22.